FABERGÉ and The Ritz London have launched a unique luxury experience for Easter 2019. 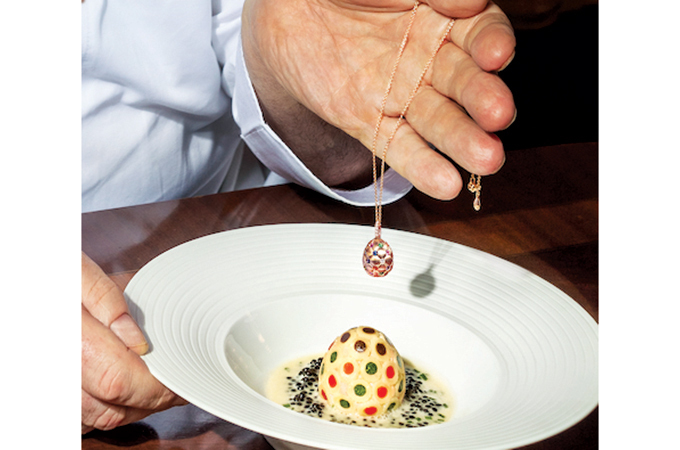 John Williams MBE, executive chef at The Ritz London, has created an edible Eggs Fabergé dish, inspired by jeweller Peter Carl Fabergé’s iconic Mosaic Egg of 1914. The Mosaic Egg was one of the most technically sophisticated and extraordinary of all the Fabergé Imperial Easter Eggs, and took over a year to craft. The egg was the work of Fabergé’s first female designer Alma Theresia Pihl. In keeping with Fabergé’s history for surprise and ingenuity, John Williams has created a luxurious Eggs Fabergé dish, which closely mirrors the multi-coloured Fabergé Treillage egg pendant. This Eggs Fabergé dish will be available for guests who reserve the three-course Fabergé menu in the Michelin-starred Ritz Restaurant during Easter Week. The Fabergé menu will be available during lunch service from April 15 until April 22, for a maximum of 10 guests per service (due to the complexity of the dish) and is priced at £295 ($384.44) per person.